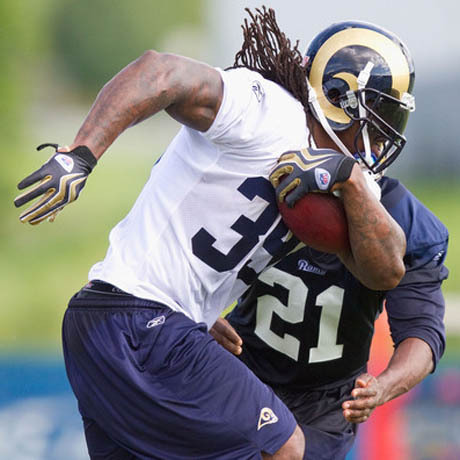 This Sunday, Steven Jackson and the St. Louis Rams kickoff one of the most highly anticipated seasons for the franchise since Steven arrived in St. Louis more than seven years ago. Steven and the Rams face off against the Eagles on Sunday for the first time since Week 1 in 2008. The Rams start the 2011 season seeking to build off last year’s six-game improvement and 7-9 record. To begin the new season, they’ll face as tough of a test as there is in the NFC, the Philadelphia Eagles. “They’re one of the elite teams in the National Football League, so it’s definitely going to be a (case) of seeing where we’re at as a young team and as a franchise coming back,” No. 39 said. Like the Rams, Philadelphia made several upgrades to its team this spring to become even more dynamic, but Steven is confident as the Rams open the season. The Rams will debut a new offense on Sunday, one that is expected to have Steven at the center on both running and passing downs. The glimpses of that new offense in the preseason have been promising and the Week 1 rollout promises to offer some surprises. Jim Thomas of the St. Louis Post-Dispatch previewed Steven’s role in the offense. Jackson is fit and anxious to do his thing in the McDaniels offense. That could mean more work as a receiver than he has gotten in recent seasons, but Jackson is all for that. If his workload decreases in this offense, it shouldn’t be by much. For the first time since 2005, which was Marshall Faulk’s final season, Jackson has quality backup help. But in the same token, No. 39 prides himself on being the Rams’ lead guy. He’s been in that role since Faulk retired and remains one of the last remnants of the every-down-back era in the NFL. However, when Steven thinks of his role, he thinks of past runners that carried the load and he wants to continue to follow their lead. To read more about Steven’s life as a lead back, courtesy of the St. Louis Post-Dispatch, click here. Through his first seven seasons, It has been an arduous journey for No. 39 in St. Louis and last season the Rams got as close to the playoffs as they’ve ever been in his career. “It’s funny,” Steven told the Post-Dispatch. “I’ve been referred to as ‘the Beast’ for quite some time. I said, ‘I’m going to look it up.’ I’ll give you a quick synopsis of how I looked at it, and how I thought of it. It is a mammal that bears the weight of something and transports it. And I feel like I’ve been a beast because I’ve borne the weight of some tough times around St. Louis. Rams general manager Billy Devaney respects Steven’s role on the Rams and what he’s been through to earn it, as he told Pete Prisco of CBS Sports. His opponents on Sunday respect Steven’s talent too and know they’ll have to be ready for a heavy does of SJ39 come kickoff. Ray Didinger, who covers the Eagles for Comcast Sports Network notes that Steven in precisely the type of runner that gives Philly fits. When players across the NFL take the field on Sunday, they will do so with heavy hearts on the tenth anniversary of the September 11th terrorist attacks in New York and Washington D.C.
Jackson said he was a freshman at Oregon State on Sept. 11. “It was actually my first training camp away, getting ready to start my own season in college,” Jackson said. 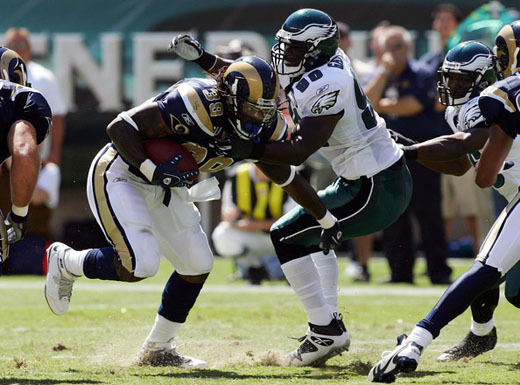 The Rams and the Eagles get the 2011 NFL season underway on Sunday afternoon inside the Edward Jones Dome. Kickoff is scheduled for 12 p.m. CDT and the game can be seen on FOX.